Christmas appears to have come early for an essential community organisation in the form of new wheels, giving the service a more professional look as well as helping to keep volunteers safer in the wee small hours. Judith came to live in Taumarunui 80 years ago this year and has been an active member of many volunteer organisations, 36 to be exact. 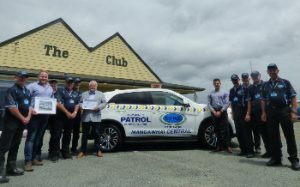 One of these organisations has been the Taumarunui Community patrol. Approximately 40 years ago, when teenagers were playing up and the Police had a curfew on them, Judith Mayer decided to join the Taumarunui Night Owls. The Night Owls used their own vehicles back then to patrol the streets. Fast forward 30 years, when still known as Night Owls and with the sudden retirement of the Chair, Judith was thrown in the deep end. There were no records, no paperwork, no nothing. Judith had to start from scratch with only the minutes she herself had kept from meetings. She had to “go it alone” and was a one-man band being Chair, Secretary, and Treasurer. 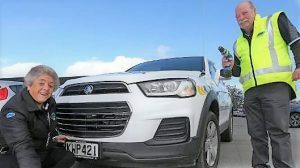 Over the years, Judith has seen many changes, the name changed from Night Owls to Taumarunui Community Patrol. They joined Community Patrols of New Zealand and Judith has led the patrol and helped it grow into what it is today. 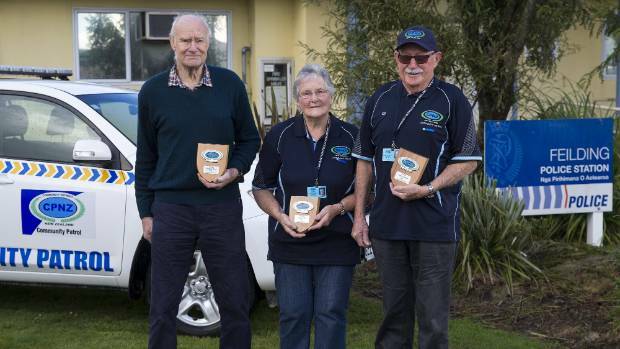 This week Taumarunui Community Patrol say farewell to Judith who is retiring after 40 years. Judith has always stated “I don’t want the kudos, I did it because I wanted to”. In her retirement Judith will continue her volunteer involvement with Creative NZ – Community Arts Council after establishing this 30 years ago. 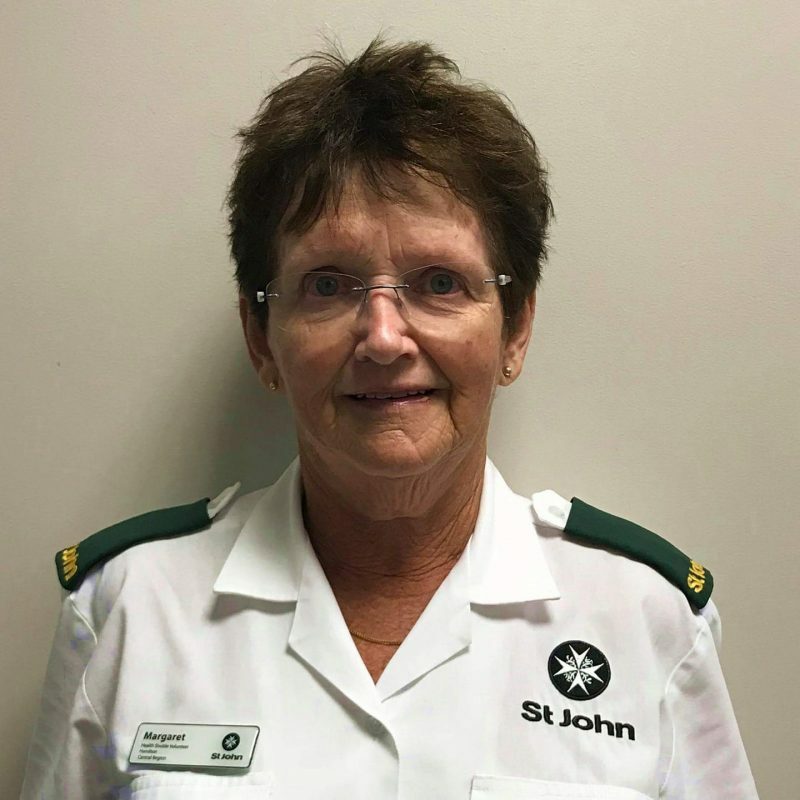 We thank Judith for her many volunteer hours spent keeping her community safe and wish her all the very best for her ventures into the future. 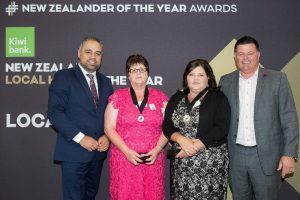 On Monday 3 December 2018 Wainuiomata Community Patrollers Tracey Mansfield and Karyn Williams were recognised at the New Zealander of the Year Awards in Wellington. 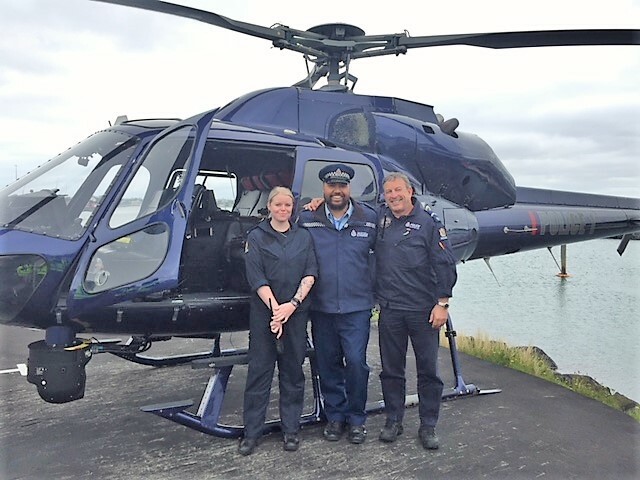 We would like to congratulate both Tracey and Karyn for their award and commend them both for the many hours of patrolling they give to their community. 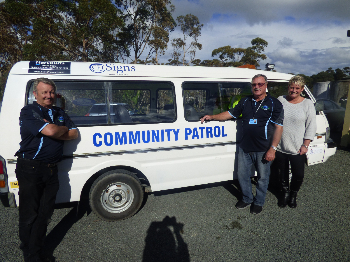 A spate of stolen number plates has prompted a community group to put the screws on perpetrators – well, almost. On 26th June at 21.30 I was entering Richmond township with my daughter. We were returning from her competing in Showquest. As I drove down Queen St and went to pull in to Warring Carpark at the rear of our local dairy, I saw a male swing with his fist to hit another male whom was homeless. I had to drive around the block as I could not reverse and in doing so my daughter picked up the phone without prompt and called 111 and asked for Police. As I got back to the front of the shop I now had view of both the offender and victim, the offender was still hitting the victim on the ground. 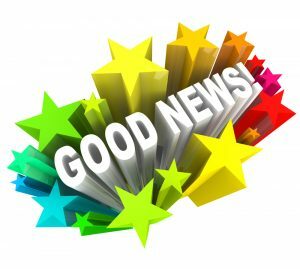 I relayed this back to comms who in turn got police dispatched to the area, I followed the offender relaying to comms his movements and had my daughter keep an eye on the victim who got up and walked in the opposite direction. Delta arrived and went to speak with the offender, he resisted arrest and had to be pepper sprayed. I then followed the victim who was of big build, I was asked by comms if I could approach him but I said no as I had my daughter with me, I was happy to give details of his movements until police arrived. At one stage I found a place where I could call out to him and asked if Ok and he said he was fine. Police arrived, I pointed in his direction, they spoke briefly and police came to me and said he did not want to talk to them but he was Ok.
As I returned to the dairy I found sunglasses and a Maori carving necklace on the road, I got a glove and picked them up and gave to police at the station. The next day, I gave police time of the assault but also my footage from my dashcam of the offender throwing the first punch. After all had settled my daughter said “Dad you were so professional talking to comms”, I said “it’s because of my time with CPNZ”. I was proud of her for calling 111, she said she is used to me talking and giving others advice to do this when incidents occur, hence why she knew what to do. 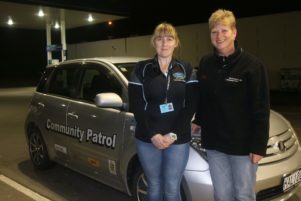 Feilding’s community patrollers have worked around the clock to prevent crime and create a safe environment for 25 years. It’s 10pm on a Friday night, and I’d normally be tucked up in bed. Instead, I’m waiting outside at the back of the Masterton police station, ready to hit the road with the Masterton Community Patrol. Picking their way through the shoppers, diners, drinkers and buskers, the Mamas are a high-vis, high-profile injection of good humour and sound advice in Wellington’s bustling Cuba Quarter. 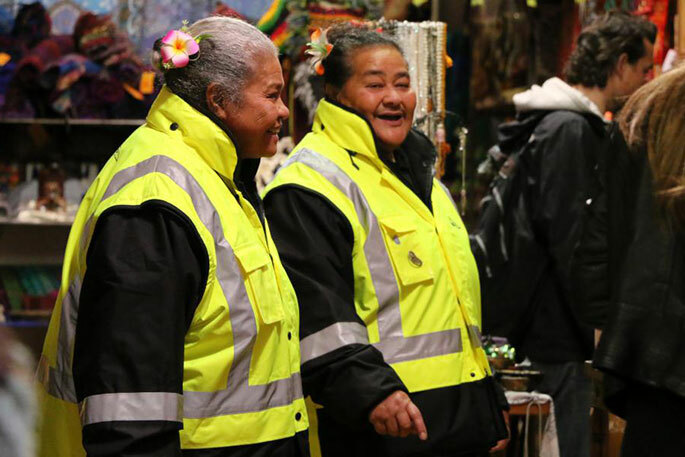 The Mamas are the more mature end of Wellington Pasifika Patrol (WPP Inc), and since last month they have been walking Cuba Street on Friday lunchtime patrols. A lot of our patrollers also volunteer for other organization’s. 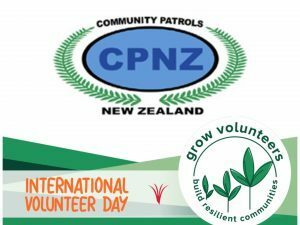 One such person is Margaret Stannard from Kiwiwatch Community Patrol Hamilton – CPNZ. Congratulations on your nomination Margaret from us all at CPNZ. The following from Volunteer Waikato. Whakatane police have a secret weapon on their side when it comes to spotting potential trouble in town. 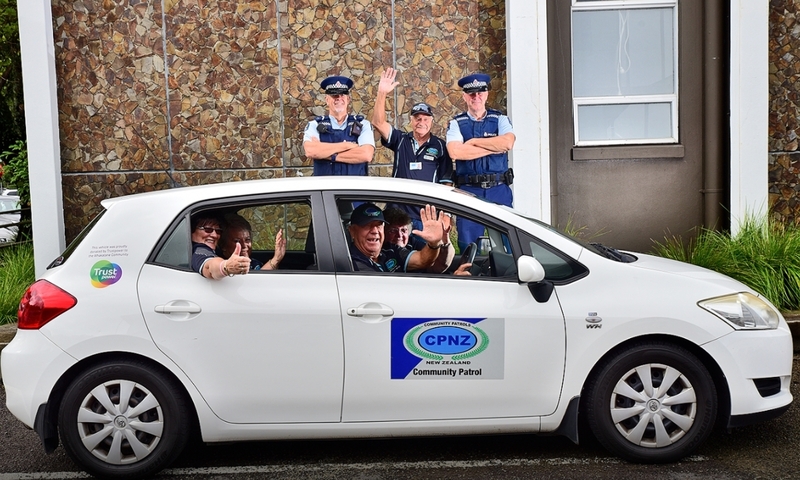 Arie Schenk was there at the beginning of Wanganui’s Community Patrols-and has now decided to call it a day. 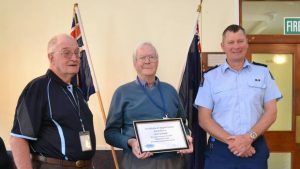 To honour the man and his contribution, a farewell afternoon tea was held last Wednesday at the canteen at Police HQ in Bell Street.